Sometimes I like to revel in the oldest prehistoric animals, put aside the great saurian to which we are accustomed to seeing and who are better known and delve me at the beginning of life, dive into the origin of evolution. When existing evolutionary branches were more diverse and where we find primitive animals and, in a way, awaken our imagination. The Jaekelopterus is a good example. If we read a book of science fiction, books describing other worlds and invented creatures living in it, we could find a Jaekeloptero swimming in its waters. Brief description of the animal: this prehistoric animal, it is the order of the eurypterids, namely Scorpions sea. Among all species of these ancient scorpions, the bigger the Jaekelopterus. Together with those dimensions, hunting is the most amazing of all. The Jaekelopterus had two pincers of no less than about 50 cm (16 ft.) in two of its appendages that could extend to grab its prey tightly. Close and personal with a rapid expansion of its appendices remained motionless at predated while it was eating it. This last detail makes us think one thing. We have said that could reach 2.5 meters long (82 ft.). But when his paws and claws extended, the length of this increased to one meter, reaching measuring 3.5 meters long (115 ft.). However, no one seems to ensure that it was a true predator, and it seems that this animal could get most of their food from the carrion of other dead animals. He lived in the Devonian, 390 million years ago, when many of the mainland were still together. Finally, these animals are a bit in no man's land. 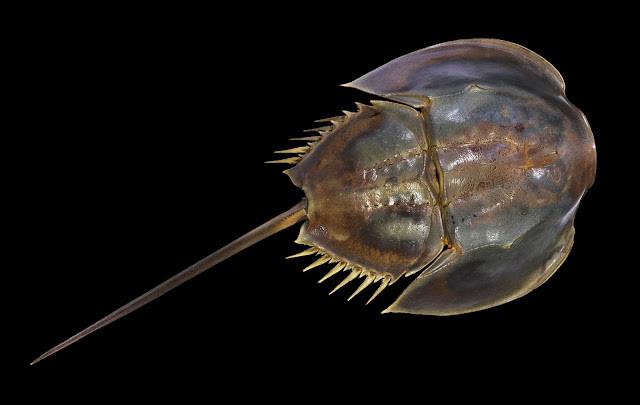 It is not known exactly whether they are really related to scorpions, with arachnids or the horseshoe crab. Etiquetas: Devonian, Jaekeopterus., predator., prehistoric animals., Scorpion giant. As its name suggests, (Camarasaurus) comes from camera .... but not the camera taking pictures. It refers to the camera as room as hollow, or internal and covered space. This refers to two bone peculiarities: the vertebrae, though robust, are quite hollow inside, and on the other hand, the skull was square and its huge nostrilsgiving the sense of having a very hollow or empty skull. But what was a Camarasaurus? It was a herbivore, a great vegetarian 18 meters long and 18 tons. It was a long sauropod like Diplodocus or Argentinosaurus. It was not as big as them, even for a sauropod, had a rather short neck and tail. However, the body was very strong, so experts estimate that could reach 18 tons. It lived 150 million years ago in what is now North America. Another curiosity is that when paleontologists mounted their bones, found a lump of hip bones. It has been speculated about this, and apparently could be that it was another brain, hip, not in the head ... I repeat: another brain in the hip. Finally, another brain or nerve plexus great about it .... still no full consensus. 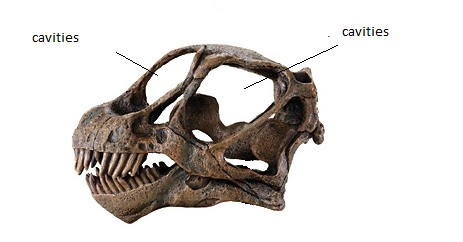 The other curiosity we can emphasize is the domed shape of its skull. 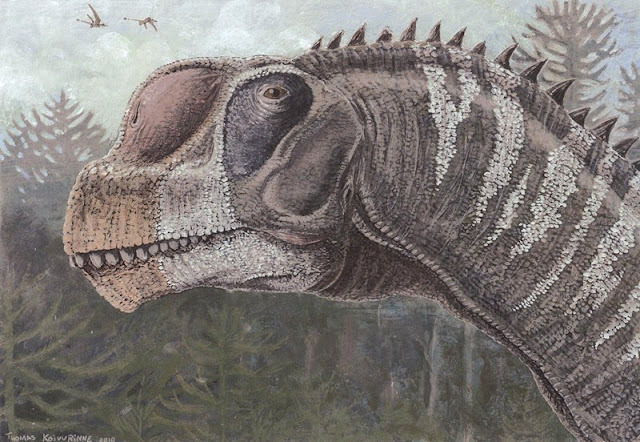 The experts believe that this will served as a sounding board to create a sound effect that could be used to communicate with other Camarasaurus. I imagine a Camarasaurus, warning of the attack by a group of Allosaurus, with a sort of nasal sound, similar to today's large ships when they enter port. The Camarasaurus could not be applied on its hind legs. Its front legs have claws capable of giving a good blow to their attackers. Analyzed his teeth, thought to eat vegetables harder than Diplodocus. It lived in the Jurassic. To facilitate digestion, it could swallow stones, as is currently done some birds and other herbivores. 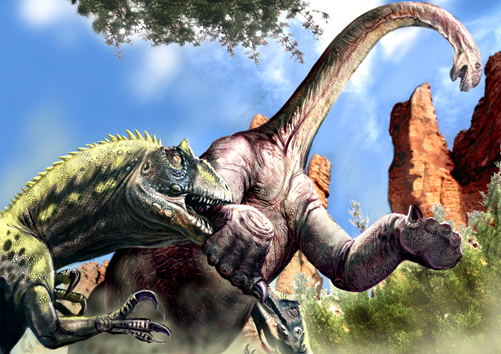 Etiquetas: Camarasaurus., Jurassic, North America., prehistoric animals, Sauropod. The most famous of the Sloths, we all know more or less, is the Megatherium. A ground sloth sturdy-looking, with more than 3000 kg (6.600 lb) . 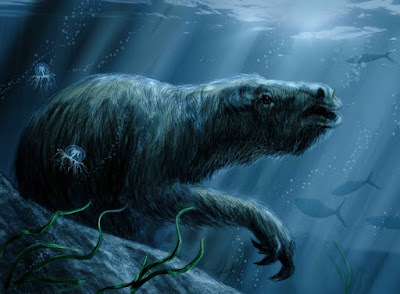 But there is another Sloths, thalassocnus, which has the peculiarity of being prehistoric and water. 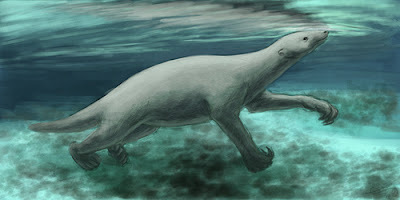 The thalassocnus moved slowly and peaceful, sometimes snorkelling hunting dangerous algae and mosses with bladed teeth. Like the Megatherium, the thalassocnus also had big, strong arms, but not to grab the branches of trees, but to cling to the seafloor, holding well to the underwater rocks while feeding. This Sloths was not as big or heavy as its cousin the prehistoric ground sloth, in fact, could be bigger for being aquatic as it can better withstand the weight ... but no. The thalassocnus could measure about 2 meters long (40 ft.), and weighs 120 kg (264 lb.). Sometimes he could leave the water and feed on land plants, but not a large as its cousin, it could easily fall prey to predators such as Sparassodonta or Amphicyon. 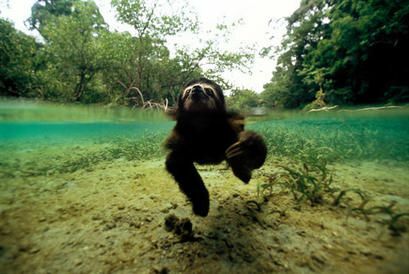 Anyway, you do not think that it is rare to see a sloth in the water. Sometimes, amazon overflows, and the only way to move from tree to tree is swimming. Here you can see a sloths, swimming ... it does very well. It existed between the Miocene and Pliocene (between 25,000 and 2.5 million years ago) in what is now known as South America. The epanterias Amplexus was probably the greatest of all Allosaurus. I say probably because many experts do not consider the rest found, the rest of a different species to allosauros. But this confusion is normal, the only bones that have been found are, 3 vertebrae a coracoid (a part of the body near the shoulder) and a metatarsal (a finger). 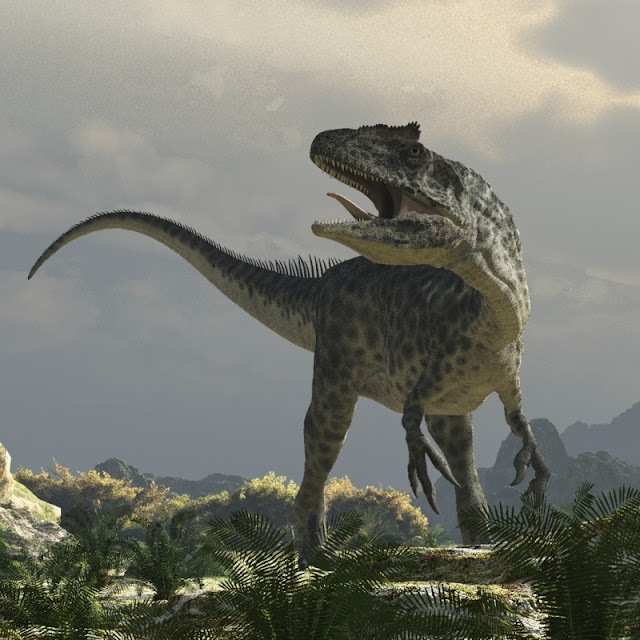 Of these fossils, after analyzing the experts, it has concluded that they were Allosaurus, which were quite large, even more than the Saurophaganax or Allosaurus fragilis. The epanterias Amplexus was a theropod (like almost all theropods, bipedal carnivores) allosaurid North America who lived around 150 million years ago ... in the Jurassic. As to its dimensionsthe measures vary between 12 (39 ft) and 16 meters (52 ft.). Respectively, the first estimate corresponds to those who think that it was only a large Allosaurus fragilis. The measurements between 14 and 16 meters are estimates of those who believe that are treated rather of a different species. Take for example the case of T. Rex. The Rex measures 12.5 (42 ft.)meters in length. Instead the epanterias Amplexus can reach 14 (45 ft.) meters according to some estimates, however, the most conservative support could reach 12 meters (39 ft.). The height of one and the other is about 4 meters (13 ft.)high to the hips. If set upright likely it reaches 6 meters. And if we calculate the weight, this would approach between 4 and 5 tonnes (2250 lb.). Only seeing the data we get an idea of their proportions. 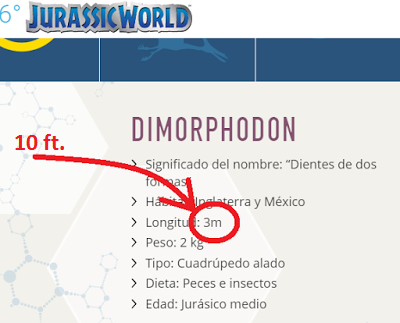 In fact, it is considered the longest of all allosáuridos, and larger and heavier than the Allosaurus fragilis ... if he really is a different species allosaurido. If we saw to it quickly, clearly we would see the differences between epanterias Amplexus the T.Rex. For example, the first has smaller than the second head. Another characteristic feature is that the T.Rex has little arms, however the epanterias Amplexus has a longer and arms with huge claws. 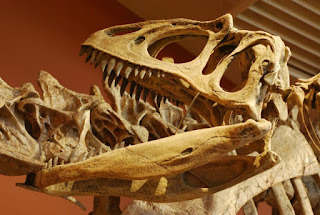 If we had X-ray eyes, we would see that the T. Rex skull is more compact, its bite was stronger. Instead, the epanterias Amplexus had a lighter skull, but the top of his skull was secure with a powerful neck and would aim a bite with the upper teeth as an ax. Among its favorite foods we would find Camptosaurus, Diplodocus and Stegosaurus ... of the greatest of all herbivores. 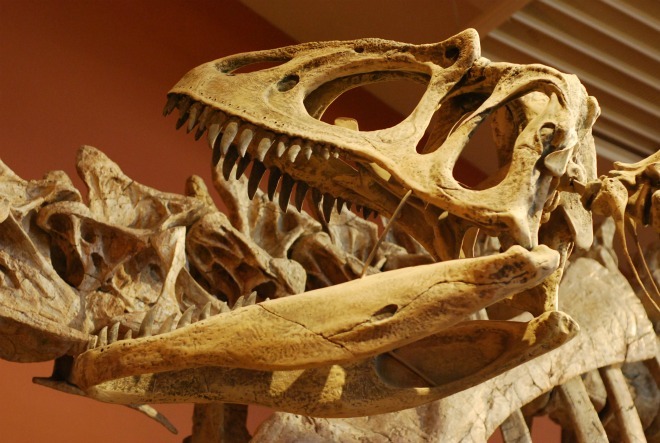 Etiquetas: Epanterias amplexus., Jurassic, prehistoric animals., T.Rex., theropods. Dimorphodon name comes from Greek and literally translate as di "two", morphe, "shape" and odon, "tooth"; "teeth in two forms." I have always liked those names because they are easy to remember, and give us clues about some of its features found. 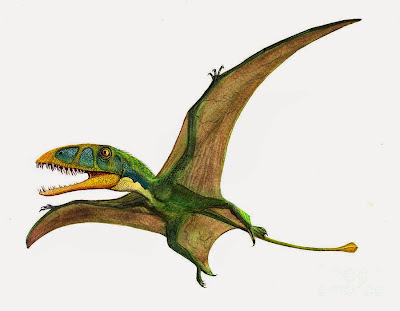 The Dimorphodon, was a small prehistoric saurian . Although it should be noted that small size at that time was 1.5 meters( 5 ft) . 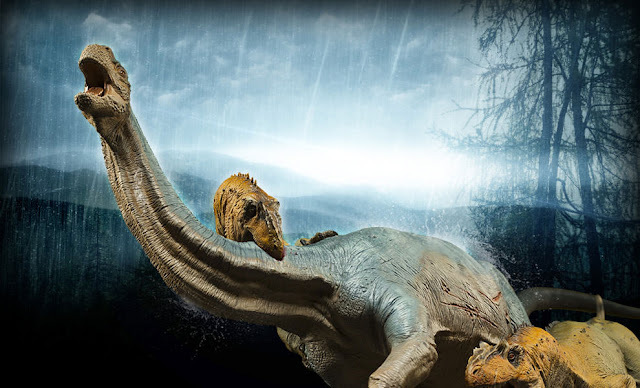 But compared with the Quetzalcoatlus nearly 10 meters wide (32 ft), the Dimosphodon, it was like a dove for a condor. In short, this size is curious, or maybe not so much .... 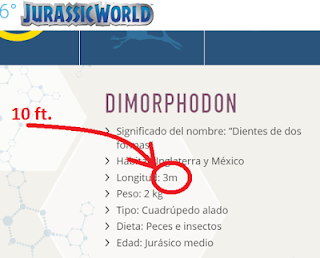 But while the scientific literature this flying lizard remained in the aforementioned 1.5 meters (5ft) , in the film "Jurassic World" comes to 3 meter size (10 ft). What do not you believe it? Do you think that the film is made in strict compliance accredited science discoveries, or that there is no intention of exaggerating to surprise more and sell more? ... Because here you have proof. Well, but let's not cruel, the truth is that thanks to films how are you, many young children and adults started to be interested and dive into the world of dinosaurs. It is a kind of social work ..... but hey, let the film we talked about it a while and have not been released. 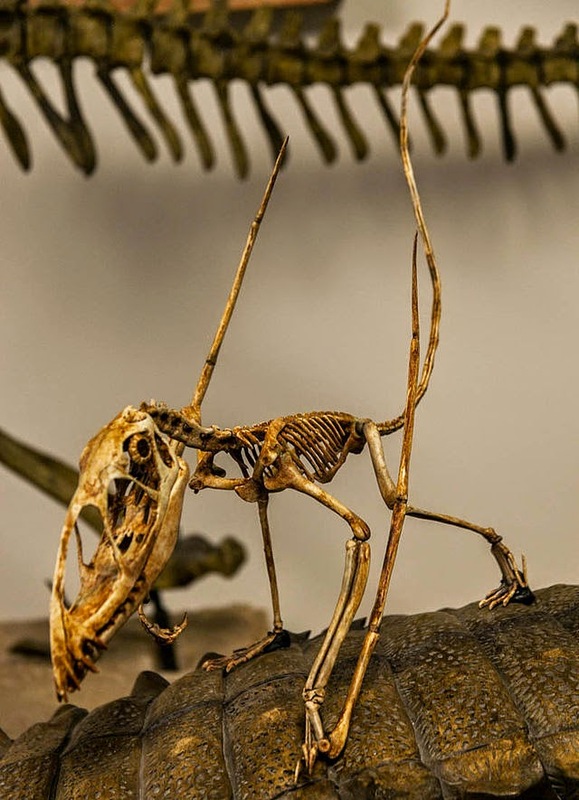 What was the Dimorphodon? As for the evidence and representations that I have observed, I could say that would be a kind of flying lizard .... a kind of crocodile with wings and the face of a Tyrannosaurus Rex. Even still flying, its body and especially the neck, was robust and strong. So it is conceivable that flying was not doing marathons. The sturdy neck responded to a pattern (in nature nothing is wasted) Dimorphodon head was large and heavy for a flying animal. Still, the skull had large openings reducías weight. Had no peak, but a mouth full of teeth, and this would introduce the topic of the teeth and their name. And in the front was elongated teeth, as long fangs run out, those teeth were prepared to hunt prey in flight (you think mostly fish). Then in the innermost part, the fangs were shorter and robust, not so ready to catch in flight, but to tear flesh from their prey. "Dimorphodon mount" by Frank Kovalchek from Anchorage, Alaska, USA - Dinosaur skeleton at the Rainbow Forest Museum. Etiquetas: Dimorphodon., Jurassic., prehistoric animals., Quetzalcoatlus.